I flew with Spring Airlines from Shanghai to Chiang Mai (say that fast 10 times). I compared flights with Skyscanner and Spring Airlines was the cheapest flight out of all the options. 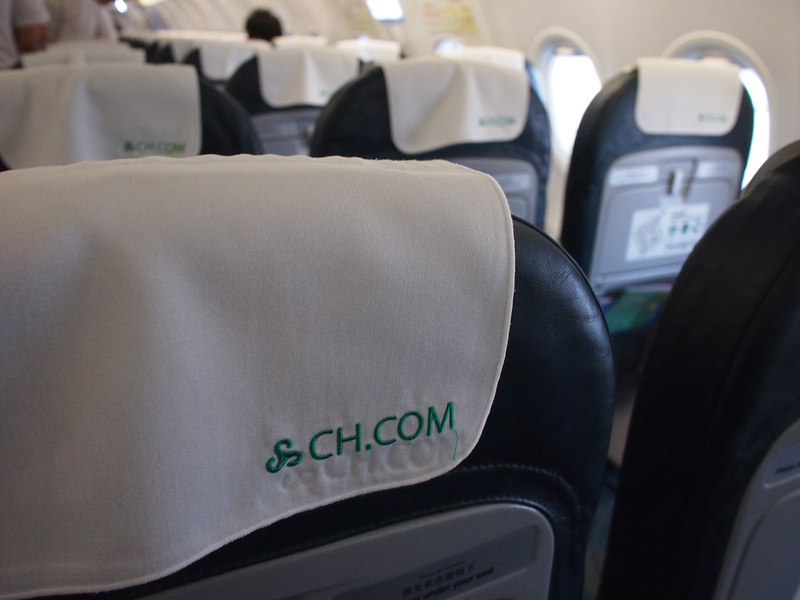 Chiang Mai has flights from all over China which would seem unusual if you didn’t know the back-story. Chiang Mai became a popular tourism destination almost overnight for Chinese visitors. The film Lost in Thailand was set in Chiang Mai, and it became the high grossing film in China. 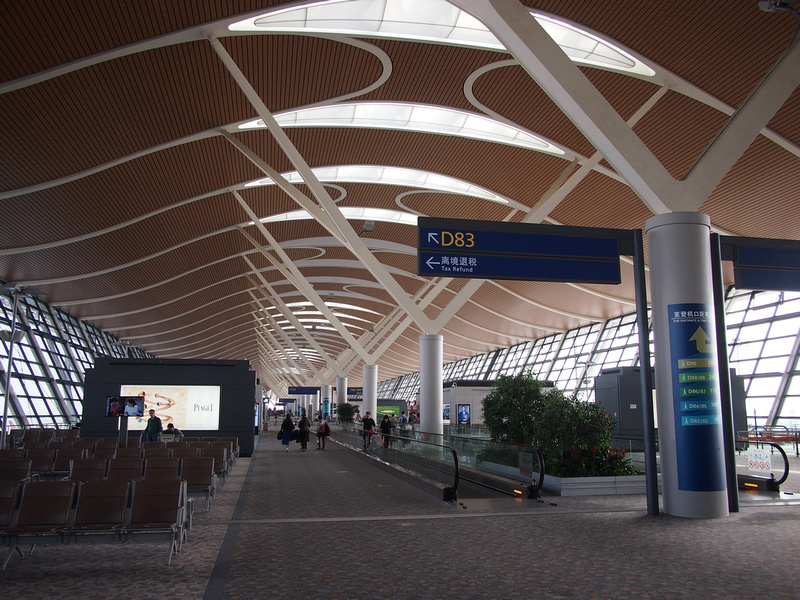 As a result film locations became pilgrimage sites, and there are now multiple direct flights from Shanghai to Chiang Mai. 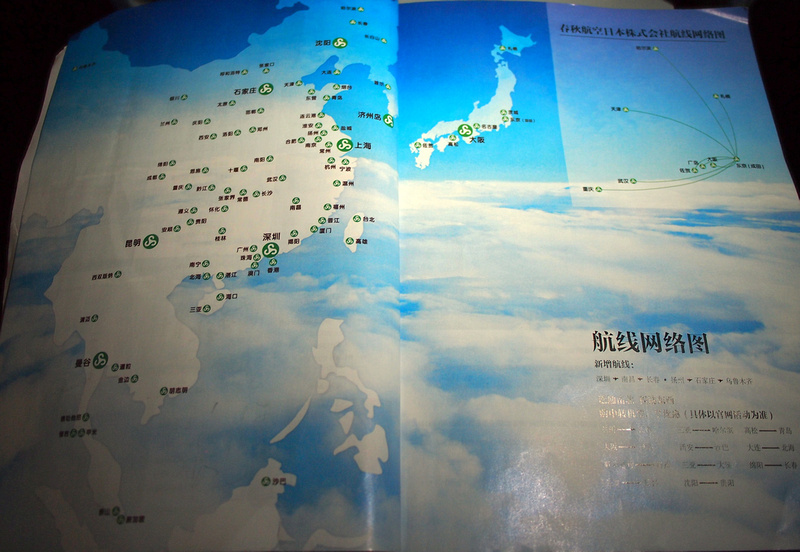 Spring Airlines are a low cost airline based in Shanghai, China. I have flown them before when I was in China in 2010, otherwise I probably would not have heard of them before. At the time of my flight they had 74 A320 aircraft, so they’re not exactly a small airline. They mainly fly in China and East Asia, with a selection of Southeast Asian destinations. I recall on my previous flight with them that I had problems making an online booking through their website. Seven years later and it seems that nothing changes as I couldn’t make the booking work with any of my credit cards. If you are trying to book travel in China the easiest thing to do is to use Ctrip. It ended up costing a few dollars more but the Ctrip site is a much better user experience and I was able to book my flight there without a problem. 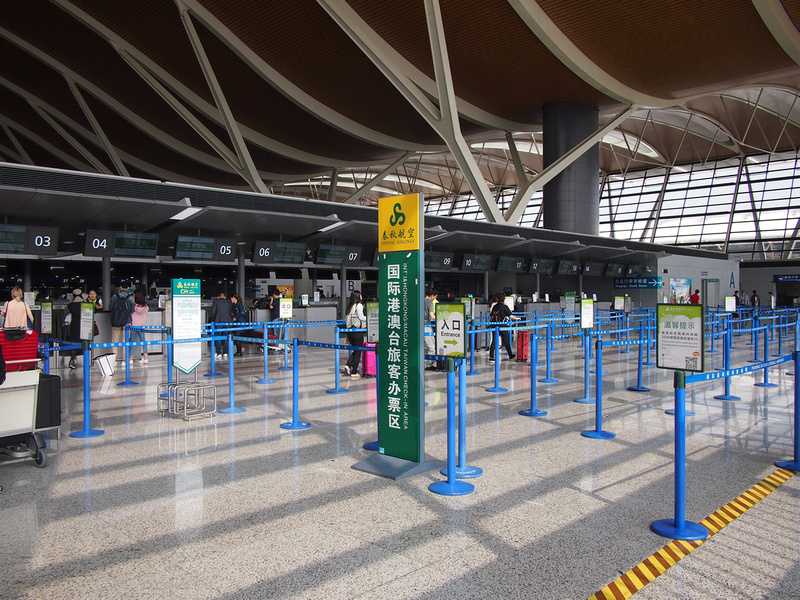 Spring Airlines have hubs at both Shanghai Pudong and Shanghai Hongqiao International Airport, so make sure you go to the right airport. At Pudong there are so many flights that they have a dedicated check in row. 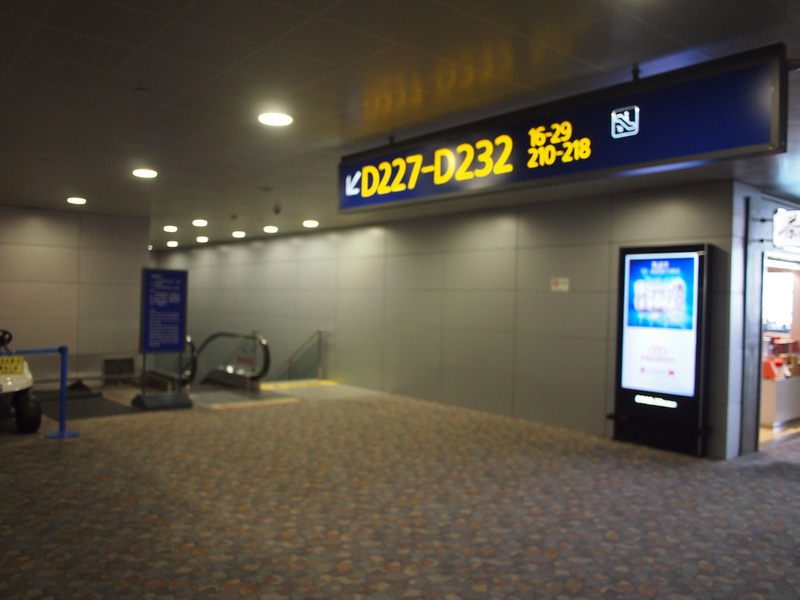 Flights depart from Terminal 2. Even with so many gates they still have lower gates for tarmac boarding via a bus. 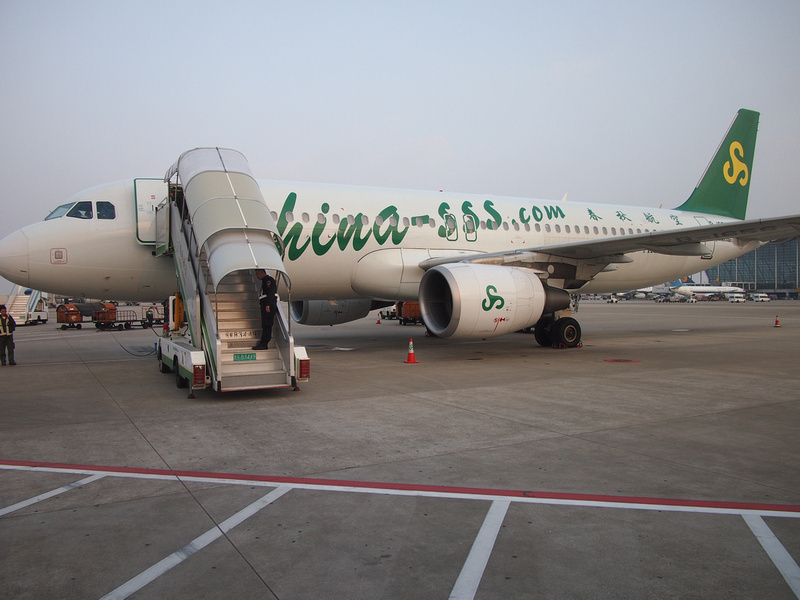 That is the Spring Airlines plane with the China-SSS.com website. If you type that that website in you will be redirected to the official website of CH.com. I’m not sure why they need CH as their website, and a two-letter domain must be worth as much as an A320 aircraft these days. I’m surprised that Switzerland was slow to pick that up back in the early days of domain registration. These days though most Chinese would probably access the official site via their mobile phone. QR codes are everywhere in China now. I wasn’t expecting much in the way of legroom, and sure enough the seats were packed tight. With my back flat against the seat there was about a fingers width between my knee and the front seat. 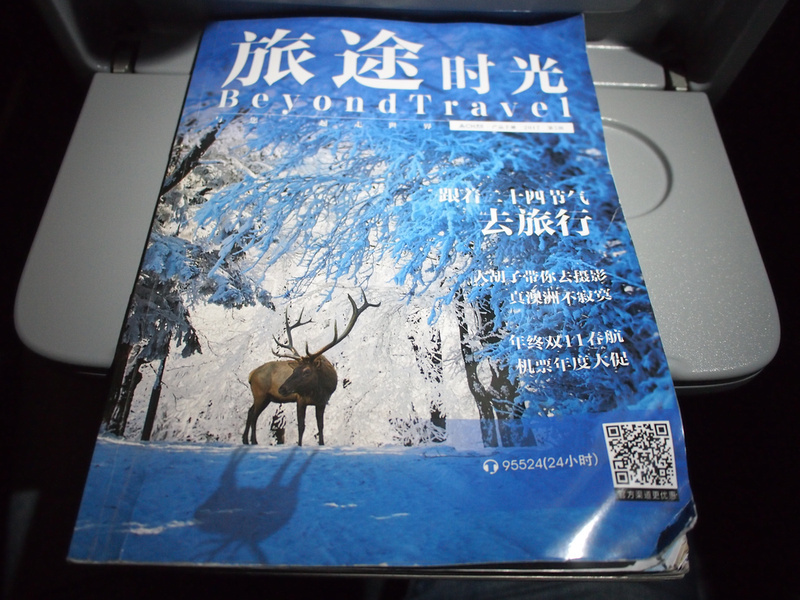 Beyond Travel – the inflight magazine of Spring Airlines. As is the custom with magazines in China, the magazine name is in English and the rest is in Chinese. The route map only shows destinations and not route lines. I knew there wouldn’t be a meal service so I had a dumpling festival at the airport before flying. 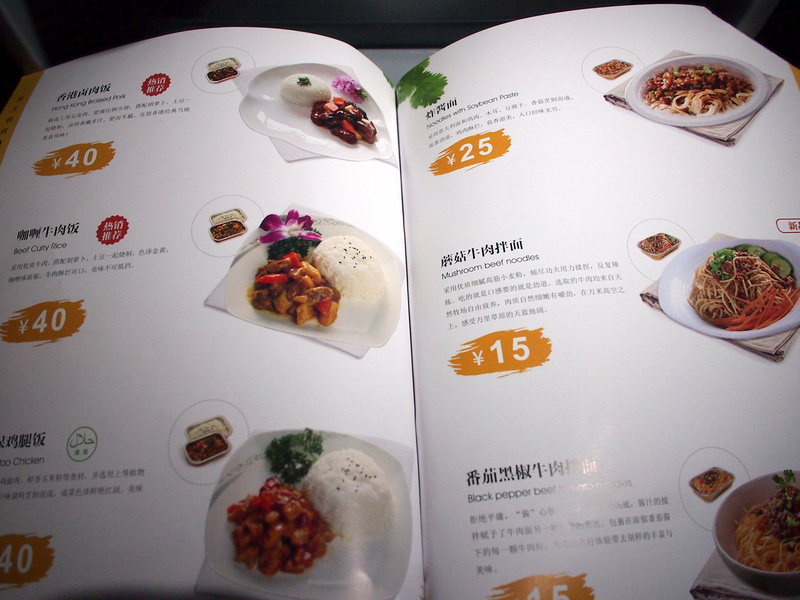 Hot meals start from 15 RMB (about $2.25 USD). 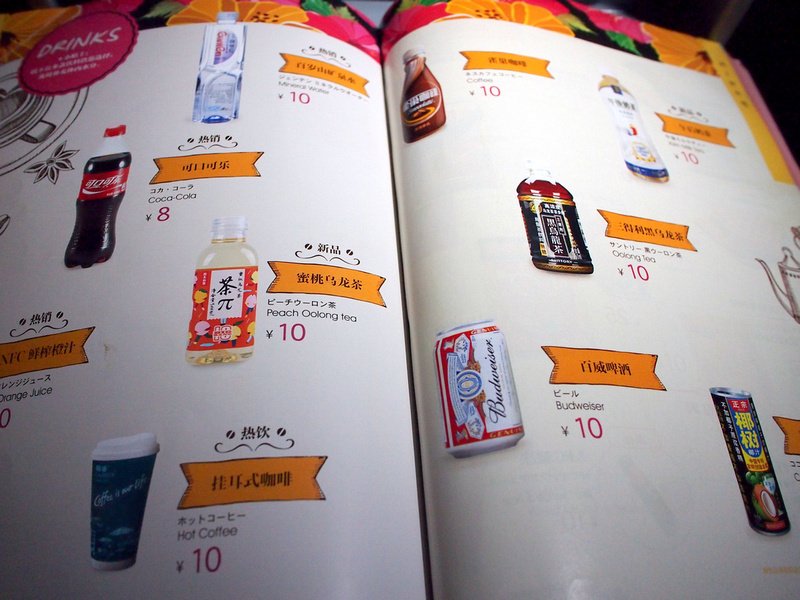 A coffee is 10 Yuan (about $1.50 USD). Total flying time is almost exactly 4 hours, which is about the limit that most airlines fly A320/737 aircraft. 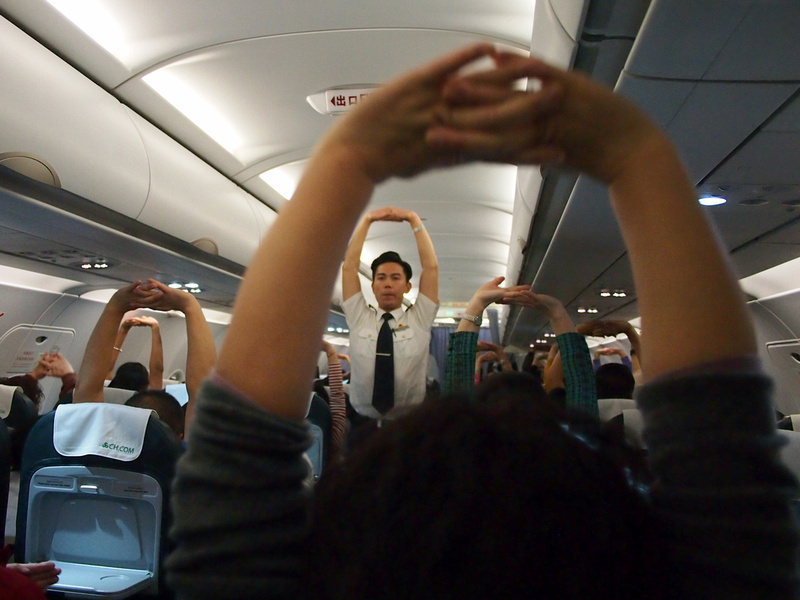 Halfway through the flight the flight attendants did some group stretch exercises. At first I thought how cheesy is this, and then I grumblingly started to participate, and then I fully joined in with the group activity. 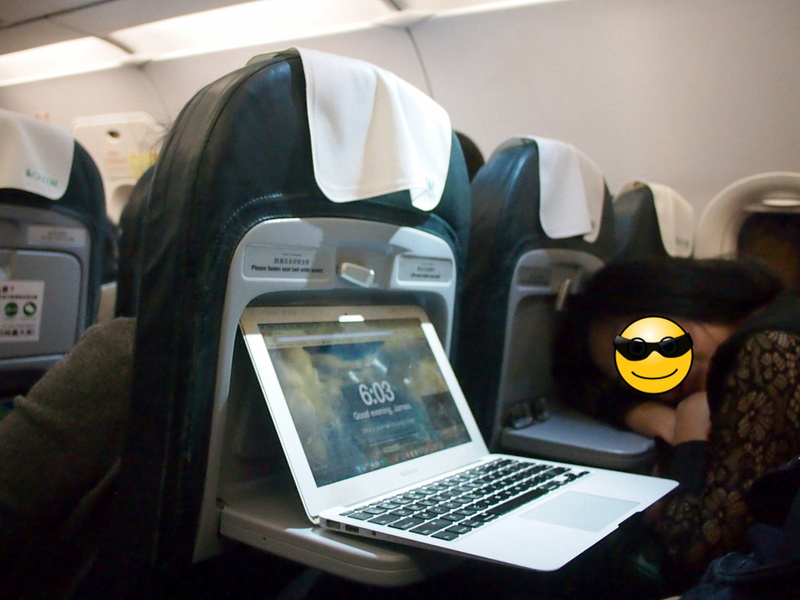 As this is a low cost airline there is no inflight entertainment, so make sure your devices are charged. The seat back tray table was a weird fold-down version that is higher than usual, which made for an uncomfortable typing height. As my seat neighbour demonstrates though, they make for a better pillow. And the seats don’t recline anyway, so if you do choose to use the tray as a pillow you won’t be rudely awakened. The captains announcements were in Chinese only (no Thai or English), and as a flight serving leisure passengers it was a noisy flight. It seemed like every passenger knew each other, and there was clapping when we landed. At Chiang Mai we were the only flight at immigration so I was counting the amount of Thai people in the Thai passport queue. I counted 5 Thai people, and 3 other westerners, so mostly Chinese passengers on this flight. 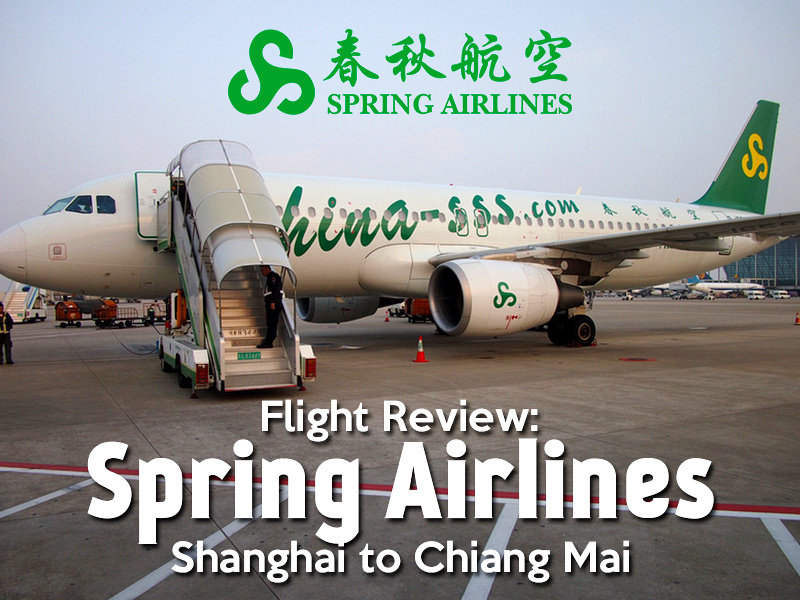 So if are looking for a cheap direct flight between Shanghai and Chiang Mai then check out Spring Airlines.